With Samsung covering practically all fields electronic, including VR, PC and other gaming solutions, you’d think there would have been a Samsung PC gaming solution already out there. Finally, Samsung’s very first PC gaming solution comes to us in the form of the Samsung Notebook Odyssey. Introduced back at CES 2017, the Samsung Notebook Odyssey comes in two sizes, with the 15.6 inch model coming in both black and white, and the 17.3 inch model coming only black. 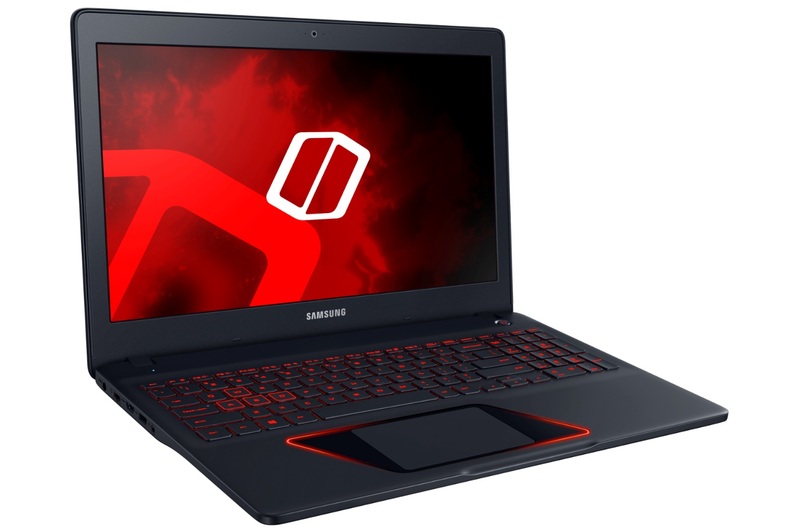 The model we plan on covering here will be the black Samsung Notebook Odyssey (15.6-inch) with a 7th gen Intel® Core™ i7 CPU and NVIDIA GTX1050 graphics. Let’s dive in! As far as visual aesthetics go, the Samsung Notebook Odyssey is an attractive laptop and that’s without adding the phrase “for a gaming laptop”. Gaming laptops are known to have that bright techy sci-fi look. Screaming to everyone around you that you’re probably playing something right about now. Trust me when I say that the flashy sci-fi look is perfectly fine; however, the Samsung Notebook Odyssey has a more subdued appearance, while only being as flashy as you want it to be. On a surface, with all of the LED’s off, you have a calm unimposing machine that fits in any computing scenario. However, if you’re looking to be noticed, the Samsung Notebook Odyssey is happy to oblige with bright red LED’s for the keys as well as for the logo on the back. Lifting the Samsung Notebook Odyssey up exposes and shows off the Hexaflow Vent—the cooling and ventilation system with a chainmail inspired design. I appreciate the Samsung Notebook Odyssey’s general overall attractiveness. The laptop has a very sleek look that says “gamer” but doesn’t scream it. It’s the kind of look that you want to show off, illuminated LED’s or not. In terms of basic ergonomics and handling, the Samsung Notebook Odyssey has a nice straight-forward build that gets the job done. The hinged ethernet port collapses when not in use and expands to fit a LAN cable once you’re ready to plug on it. The Hexaflow Vent doubles as an access door to the Odyssey’s memory, allowing for easy and straightforward upgrades. The laptop itself has just the right amount of tilt, not only to provide a bit of an angle for the keyboard, but to allow the Hexaflow Vent to do its job. With the ventilation being arranged at the bottom, uncomfortable exhaust is blown away from the hands, as it should be. As far as general laptop chassis builds and designs go, the Samsung Notebook Odyssey keeps it intuitive while maintaining an appealing and inviting sense of style.